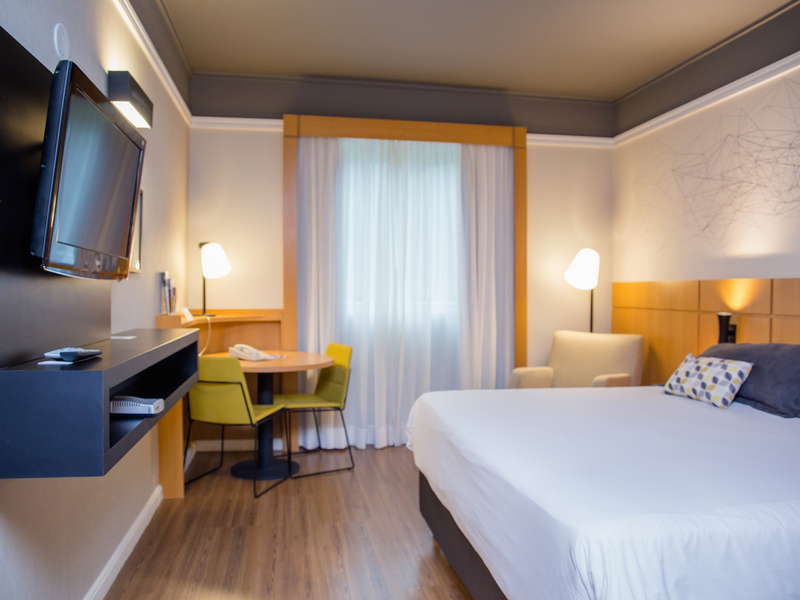 The hotel is located in the famous Jardim District, opposite the Grand Plaza, next to the Celso Daniel Park. We are 15 Km from SP Expo. And the hotel has a cosy décor, air conditioning, Wi-Fi and a 24-hour room service. French delicacies such as croissant and pain au chocolate are served in the breakfast room. The restaurant offers the best of international cuisine. For those seeking the hustle and bustle of Santo André, Rua das Figueiras is home to the best bars and restaurants and is a nightlife hotspot. If shopping is more your thing, the Grand Plaza and Shopping ABC shopping centers are a good place to start. Paranapiacaba in winter and the coast in summer - great destinations for a weekend break in Santo André. We have Wedding Night and romantic package, contact us! Rooms for parents with children are available. Please consult our rates and conditions. Meet our Burger Fast from November 23rd to December 09th. Looking for somewhere to enjoy happy hour? Our wonderful space boasts a fantastic menu. There is only one word to describe the 126 apartments - charming. Great service and great breakfast! The front desk was very helpful and even loaned me an adapter as I had brought the wrong one. There were many options for breakfast and the food was fresh. A great environment! Very good. The front office staff were helpful when I emailed a question regarding nearby shopping. As above. I was very satisfied with the hotel. Very clean and quiet. Obviously less employees (nobody in restaurant during breakfast), only one rather slow person at reception desk, it took me 30 minutes to check out. Cleaning and maintenance worse, support in shower broken, black spots in shower. Paper bags of previous guest still in the room. no kleenex in box in bathroom. everything worked out perfectly well, from the check in to the check out. Easy and quick to book, same about check-in and the room was comfortable and clean. It was ok. Sanitation could be better but I understand this is largely outside the control of the hotel. Iron and ironing board in the room would have been useful. I don’t like having to request these. International sockets and USB charging ports should be standard in all rooms these days. The hotel is nice, beds are comfortable, a/c is ok (one room was better than another). The restaurant was out of several things we tried order. Front desk staff is very friendly. Very nice hotel in a very well located area. I have booked the hotel via the website hotels.com and unfortunately during the check in the desk attendant told me that the reservation wasn't in his system. We filled the paperwork and he said that should be fine to verify by the checkout. I had on my iphone all the paperwork from hotels.com with the reservation number and all the good stuff. During the check out process, again, they could not find the reservation and they were asking me to ring the site. I did and I lost almost 45 minutes on the check out desk trying to connect the attendant from the hotels.com with the local attendant. Finally, the hotels.com gave the local attendant a credit card number to charge the room and I left the hotel. I understand that this is likely to be a problem with Hotels.com, but as a customer the hotel is translating a problem between these agencies back to the me, which made me very annoyed with the process. You need to create proper communication channels with these companies if you would like to accept and publish your hotel on their website to handle these problems quickly. The desk attendant said they always have problems with these agencies (booking, hotels.com), which is odd, because I have been using the site hotels.com for 10 years without a single problem across EMEA and Latin America. Again, I appreciate the problem might be with Hotels.com and this created a horrible customer experience. Reception was great, very clean hotel, perfect room, but it doesn't help all the positive aspects if the check out is a complete disaster. This is a feedback from a customer that works in some level on a quality/experience process for a end user/customer at my work. Room is becoming a little worn, but not bad. Good hospitality More variety of hot meal for breakfast would be nicer to visitors. It was fixed and limited every day.